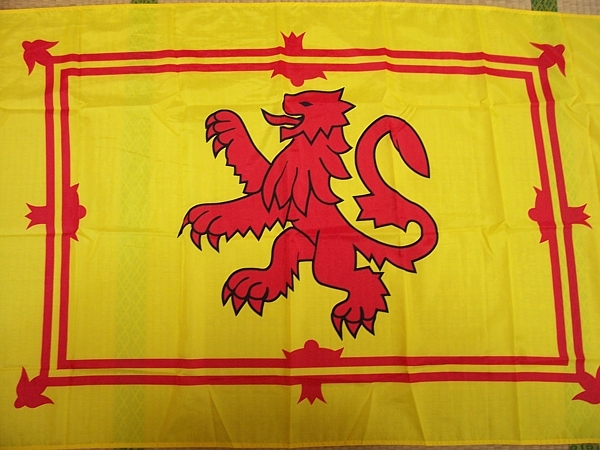 The Royal Standard of Scotland, also known as the Royal Standard of the King of Scots, or, more commonly, the Lion Rampant, is the Scottish Royal banner and as such is to be used only by select Great Officers who officially represent the Sovereign. As the banner of the Royal Coat of Arms of the Kingdom of Scotland, it was used by the King of Scots until the Union of the Crowns in 1603. In heraldic language, the banner is specified as Or, a lion rampant Gules armed and langued Azure within a double tressure flory counter-flory of the second; meaning, a gold (or) background displaying a red (gules) upright lion (lion rampant) with blue (azure) claws and teeth (armed and langued) surrounded by a double border (tressure) decorated with opposing pairs of floral symbols (flory counter-flory), also red (of the second). The symbol of the lion is thought to have been adopted in the early twelfth century by William I, nicknamed "William the Lion"; but there is no evidence of its use before 1222, when Alexander II, William's son and heir, used it as the Arms of the Dominion of Scotland. 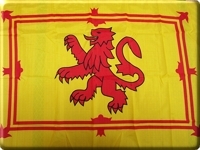 It has also been suggested that the lion was first adopted as a symbol by Malcolm III in 1061, since the central lion rampant motif was used as a badge by Scots descended from clans that had migrated from Ireland. Following the Union of the Crowns in 1603, the banner was incorporated into the Royal Standard of successive Scottish and then British monarchs. Today it is used officially at the Scottish Royal residencies of Holyrood Palace and Balmoral Castle when the monarch is not in residence. As the personal banner of the monarch, its use has been restricted by a Parliamentary Act since 1672. The government officials that are allowed to use the Royal Standard are the First Minister, Lord Lieutenants, the Lord High Commissioner to the General Assembly of the Church of Scotland, and the Lord Lyon King of Arms. The Duke of Rothesay, heir apparent to the King of Scots, uses a variation of the Royal Standard as his personal Standard. Nevertheless, the flag is used unofficially as a second national flag, particularly at football events.